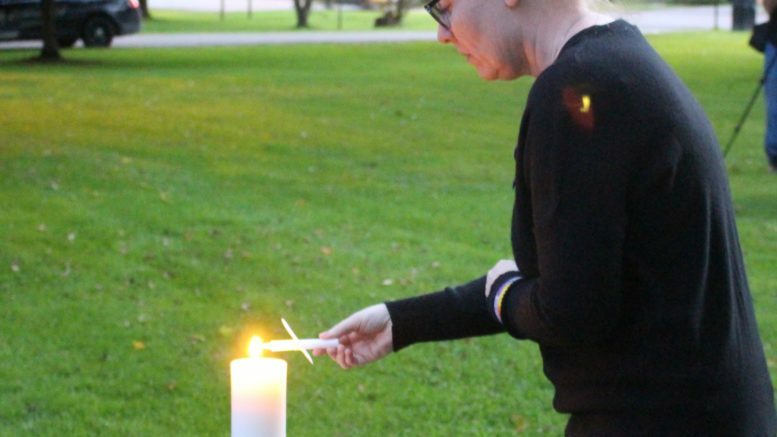 “One life lost is too many,” Sheriff Lance Benedict said at Friday’s Candlelight Vigil for Suicide Awareness as he welcomed people to the event in Midtown Park in New Milford. Paul Wetherill, 28, a Certified Recovery Specialist with Trehab, spoke about his personal journey, noting many know about his professional life and his personal life as a friend, soon-to-be-husband, and dog owner. But many, he said, did not know he is also a person in recovery, an overdose survivor and a suicide attempt survivor. “I am an example of those two truths,” he said. “It’s okay to be afraid,” he said. “That means you’re about to do something terribly brave,” he said as he advocated to those struggling through depression and mental health difficulties to reach out for help. Katrena Chrysler has been struggling with depression since she was 13 years old. After giving birth to her first child at age 18, she said she found the will to live. Chrysler described years of struggling with depression and turning to alcohol, as she bravely detailed her life at the vigil. It was the suicide of a family member in 2011 that served as the impetus for her to seek help, but not until years after. “In 2015 I started to deal with the grief,” she said about the time she acknowledged she needed help. Chrysler said she was first hospitalized in 2016 –the first of seven. In January 2017, she attempted to take her own life with pills. “I couldn’t get out of my dark spot,” she said. Chrysler told people to check on friends, offer smiles and kind words to strangers, and that could save a life. “You don’t know,” she said. Jason Clapper, pastor at the First Presbyterian Church in Montrose, also served on the Suicide Awareness Initiative and is a current member of the county’s Substance Abuse Recovery Initiative. “This disease affects us all,” he said. 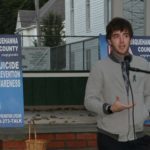 “The suicide rate in our county is at least twice the national average,” he said, noting the SAI report that said people in the rural area don’t feel connected, often lack transportation and resources. He spoke of growing up in poverty in the Susquehanna area, and meeting a person who profoundly impacted his life who taught him, “No matter who you are, or where you come from, you have a purpose,” he said of the life lesson. Be the first to comment on "‘Where there is life, there is hope’ : Suicide Prevention Lifeline: 1-800-273-talk"